Interesting, informative, insights reference to the United States Congress and its issues and dynamics. Once started, I could not put it down and I read it all of the way through. To paraphrase the old saying: "Politics is like sausage, you don't want to see it made." Stearns outlines in a series of topical chapters an mélange of personal, moral and classical philosophical observations coupled with a variety of major issues, analyses and preferences. He describes the hard nasty trade-offs of congressional committee appointments and the policy ramifications e.g., the dichotomy of what is best for the member of Congress versus what is best for the country. Rarely are these elements congruent. His vignette totally reflects why government is ineffective and inefficient. To quote a long ago graduate school professor of mine, "The stated purpose of legislation is never the real purpose; rather the unseen one is the real one." This is the reason why all citizens who are interested in our country and its future welfare should read this book. - LT COL Ed Johnson, United States Army Ret. Life in the Marble Palace is a wonderful book about how things really work in Congress. I am a strong advocate for teaching more Civics - basic government. This book tells of Cliff Stearns's gargantuan efforts over a twenty-four year period of service in the U.S. House of Representatives. In particular, I was impressed with Congressman Stearns's description of how as a committee chairman he had to raise a certain amount of dollars for the party to keep the chairmanship. I had an identical experience when I was chairman of the Senate Science, Commerce, and Transportation Committee. Cliff Stearns is leading an effort among the reformers to try and get campaign spending under control. His book is the only place I have read a clear description of how raising money has become a way of getting chairmanships on committees and subcommittees. It is certainly also true in the U.S. Senate. Cliff Stearns's book should be read by every high school student in America as it describes how legislation is really made in Congress. Also, Cliff points out that Congressional travel is very necessary. I was glad to see that candor as it is so essential that our members of Congress have international exposure. Cliff had the courage to say so. As a former 24-year Member of Congress, Cliff Stearns provides an intriguing look into our legislative branch, especially the House of Representatives. In a series of essays, Stearns takes us into the the U.S. Capitol and congressional offices and gives the reader his unique insight of how the process works – the fundraising, casting votes, balancing the elected officials’ values and experiences with those of the constituents. Stearns lays out the unvarnished facts behind the legislative process. This is not a simple civics manual but rather this book ties the function of Congress to specific examples: the financial crisis and the bailout of Wall Street, Obamacare, and assorted scandals involving individual members. Stearns names names and takes them to task, specifically former Speaker of the House Dennis Hastert and former Treasury Secretary Hank Paulson. Interspersed throughout the book, Stearns includes his thoughts on freedom, government, American exceptionalism, philosophy, and religious faith. He engages the reader in considering divine law and individual freedom. The reader learns about the drudge of fundraising members endure, and the maneuvering and infighting required to progress through the committee system. Stearns shares his own struggle toward the chairmanship he earned. The author also highlights the role of the almighty dollar throughout the workings of Congress and its corrupting influence. 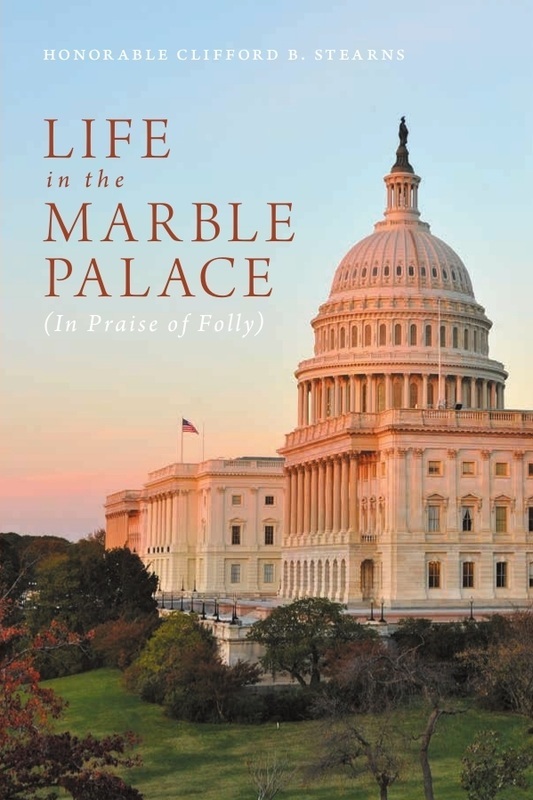 Life in the Marble Palace, Stearns’ first book, underscores the value of limited government to preserving our freedoms, and treats readers to a robust evaluation of American democracy at work, and at its failures. This is a must read for anyone who wants to get beyond the mundane of legislative procedures and see how the legislative branch really functions. Good description of the "swamp" by former Congressman Stearns. contributors’ wishes, the best interests of the nation, and what is morally right. ultimately there must be compromise for anything to be accomplished. amendments to cut appropriations bills by as little as one percent, and they all failed. to know how Congress really works and how it should work. Life in the Marble Palace is a surprise. It's hard to find a Congressional memoir whose work and author, facing the "dirty devices of the world"... still retain that quintessential American characteristic: optimism. The book give reader some insights into some the key policy fights (Obamacare, for one) that occurred during his tenure. He also gives the reader a good accounting of what it means for a citizen to come to Washington and survive and yes, even thrive. He pulls no punches on the hard realities of day-to-day political survival of today's House Members and even defends some unpopular practices e.g., foreign travel by members at taxpayer expense. There is a much maligned adjective in today's cynical atmosphere: "earnest" (resulting from or showing sincere and intense conviction). The author is, in the best sense of the word, earnest. That, combined with his surprisingly retained optimism makes Life in the Marble Palace worth the read. C​liff Stearns' Life in the Marble Palace is a real eye-opener. He had me on page 9 with: "Is there divine punishment for an individual or nation that does not obey God's laws, universal laws, Kant's laws and / or natural law?" What lingers for the reader is his view that "an overriding issue for our nation and its historical destiny is that no democracy and / or republic has lasted more that 240 years. For us to survive, our country must be restored." He lays out a convincing argument with the courage it takes to see things for what they are. Stearns provides us with a felt sense of what his life as a Congressman over 24 years has been about; the glories, the realities, the dilemmas, the view from the inside - and also how our nation and its governance has evolved since 1776. We are also left with a much deeper appreciation of what is the highest calling for a legislator and some of the obstacles that stand in the way today. Still, when one considers the possibilities, the potential to support the common good, there can be few greater callings. I'm also inspired by the philosophies he calls out that have informed his view as a leader and legislator, among them: the Federalist Papers ('the powers delegated by the proposed Constitution to the federal government are few and defined"), Herodotus ("every action has impact for good or evil"), Seneca ("he who is afraid to lose an election will never be able to do what is right"), Kant ("make no law that cannot be universally applied to everyone in the world"). Bottom line: not separating morality from politics. A key take-away from the book is that it is time for extraordinary courage to stand up for and implement the rebirth or restoration Stearns calls for. He knows that this can and must begin with Congress...and each of us. "This work delivers a thoughtful appraisal of American democracy and an edifying peek into the corridors of political power. An assemblage of admirably forthcoming first-person essays about the practice of American legislation." "This congressional exposé contains much hard-won wisdom and heartfelt critique, and should be read by every concerned citizen. In Life in the Marble Palace: In Praise of Folly, Clifford B. Stearns, a twenty-four-year member of the House of Representatives, lifts the curtain on what it’s like to be “on the board of the most powerful body in the world—the United States of America.” Revelatory and sometimes shocking, Stearns’s report of what really goes on behind the scenes in the United States Congress is a call to all American citizens to wake up and take action to preserve what is left of the nation’s threatened democracy."